Jockey Sam Twiston-Davies has admitted to mixed emotions after missing the ride on Grand National winner Pineau De Re at Aintree. Leighton Aspell partnered the 25-1 shot after Twiston-Davies accepted an offer to ride top weight Tidal Bay for seven-time champion trainer Paul Nicholls. Twiston-Davies had previously ridden Pineau De Re in six races. "It's hard to see a horse you've ridden and worked with go and win like that," said the 21-year-old. Was a strong-finishing third, beaten a nose and a neck, in the Pertemps Hurdle at the Cheltenham Festival. The 2010 National winner Don't Push It used the same contest as a warm-up. He is the same age, 11, as the last two winners of the Aintree showpiece. His name refers to an aperitif wine produced in the Charente department in western France. 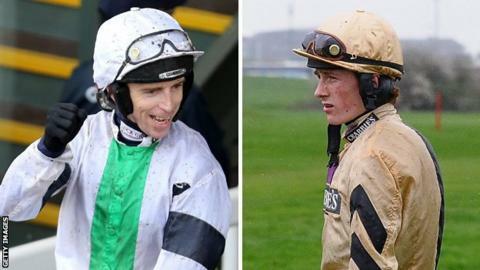 "I'm delighted for Leighton Aspell and Dr Newland. He said to me a long time ago that he would win." Twiston-Davies, who rode Pineau De Re to third at last month's Cheltenham Festival, was one of the early departures in a race in which all 40 runners and riders returned safely, 18 completing the course. Having been unseated at the eighth fence, the Canal Turn, Twiston-Davies said he ended up talking to a fellow jockey about missing a National winner - Aidan Coleman, who rode Mon Mome in 2008, but was not on board for his 100-1 win in 2009 after switching to stablemate Stan. "I fell at the Canal Turn. Aidan fell at the next fence. We ended up in the same vehicle on the way back and we had a chat about it," said Twiston-Davies. "Aidan told me not to worry about it, and that it will make me a much stronger jockey in the future, and that's one thing it definitely will do." Although Twiston-Davies had told the BBC before the race that Tidal Bay was "no ordinary 13-year-old", the horse would have been the oldest winner of the National for 91 years. "Tidal Bay was second or third favourite and I was very happy to ride him," said Twiston-Davies, who has been booked regularly by Nicholls in recent months, prompting speculation about a more formal long-term alliance. "He got into a lovely rhythm but everyone is jockeying for position at the Canal Turn. One fell in front of me, and I had nowhere to go." Of the winner, he added: "Pineau De Re's run at Cheltenham was very solid and he came here with a good each-way chance." Until May last year, the French-bred gelding was with Philip Fenton, an Irish trainer who is facing a drugs inquiry. Fenton faces a court hearing next month after being charged with possessing banned substances, including anabolic steroids, following an Irish Ministry of Agriculture visit in January 2012. The horse passed three post-race dope tests - at Thurles in October 2011 and January 2013, and at Downpatrick three months later - before moving to Newland's Worcestershire yard in 2013. An in-competition test at Market Rasen last July returned negative as did another test carried out during an unannounced visit to Newland's stable in October. "The horse came from Philip Fenton and I only really spoke to him for some advice on travelling the horse as the horse is a bit of a worrier," said Newland. "He was very helpful but I haven't had much discussion with him."